Remember When There Was No App Store? “There will be an unbelievable effort within Apple to determine how this happened and I don’t envy the person that did it because there will be no forgiveness for it,” says Ben Wood from the technology consulting firm CCS Insight. Over the weekend, somebody spilled critical details about the new iPhone models to the websites 9to5Mac and MacRumors. We’re not talking about hearsay or minor details of the sort that keep Apple fanboys in a state of arousal and lined up outside Apple stores for days on end. This is the actual “golden master” code going into iOS 11, the next iteration of the iPhone’s operating system. “I’m nearly certain this wasn’t a mistake, but rather a deliberate malicious act by a rogue Apple employee,” says tech blogger John Gruber. And so CEO Tim Cook’s dog-and-pony show unveiling the new models — scheduled for 1:00 p.m. EDT tomorrow — will be profoundly anticlimactic. “More surprises were spoiled by this leak than any leak in Apple history,” according to Gruber. Near as we can tell now, there will be two versions of the iPhone 8, priced comparably to the current iPhone 7… plus an ultra-high-end iPhone X costing close to four figures. The code includes facial-recognition features that will offer an alternative to the current “Touch ID” fingerprint system and a way to sense your facial expressions and turn them into animated emojis. But for all the buzz in Apple world this morning, the most revolutionary part of the new iPhone has been known since June. “This is one of those huge things that we’ll look back at and marvel on the start of it,” CEO Tim Cook said last month. We mentioned it on Friday — augmented reality, or AR. In fact, one analyst at Morgan Stanley tells the Journal AR will be as big a deal for Apple as the launch of the App Store itself in 2008. The App Store created a ginormous new revenue stream for the company that simply didn’t exist before. We daresay AR will be even bigger than that. Apple’s foray into AR sets the stage for the day the iPhone itself will become obsolete. It’s not just us saying that. It’s Gene Munster, too. He’s a legendary name in the tech world. He spent two decades as a tech analyst for Piper Jaffray. And not the kind who only pored over spreadsheets; he acquired a reputation for getting at ground truth, standing in line with Apple fanboys to gauge demand for each new version of the iPhone. Last year, he struck out on his own — launching the venture capital firm Loup Ventures. Our own tech maven Ray Blanco sees AR ballooning from a $2.6 billion industry this year to $7 trillion a decade from now — a growth trajectory of 269,130%. Of course, you won’t generate those kinds of gains just buying Apple shares. Apple is the biggest publicly traded company in the world. Instead, you want to identify the small-fry companies Apple is counting on to make its AR vision happen. Those are the ones with the potential to grow as fast as Apple itself did way back in the day. If you missed out back then, here’s your second chance. Stocks are rallying and gold is tanking this morning — supposedly because the news over the weekend wasn’t as bad as first thought. It turns out Hurricane Irma’s strength got sapped by its run-in with Cuba on Friday. Florida isn’t taking nearly as big a hit as first feared, even if 60% of the state is without power as we write. Thus Irma won’t be as big a drain on the U.S. economy as it seemed three days ago. With that, the Dow is up more than 200 points, past the 22,000 mark again. Meanwhile, North Korea’s government did not mark the 69th anniversary of its founding Saturday by conducting another missile test. So the “geopolitical risk” that was priced into gold late last week is coming back out; the bid on the Midas metal is down to $1,331. Yes, that’s down $20 from a few days ago, but it’s still up $120 over the last two months. Then again, it might not take a hurricane to tank the U.S. economy during the final four months of 2017. We’re late in taking note of the most recent Philadelphia Fed State Coincident Index. This index crunches four different job numbers from all 50 states. It runs on a scale from minus 100 to plus 100. Readings of plus 50 and below have called the onset of every recession going back nearly 40 years. The July number released a few days ago is… gulp… plus 36. It’s the weakest number since late 2009. Looky here: The devaluation of the Chinese yuan, foreshadowed here on Friday, is already underway in earnest. Effective today, the Chinese central bank has lifted a two-year-old rule that made it more costly for traders to lay on bets that the yuan would fall in value. “Beijing is shifting course from an effort started two years ago to keep the yuan from weakening too quickly and to maintain confidence in the world’s second-largest economy,” says a front-page Wall Street Journal story today. Those efforts are no longer necessary. In fact, as Jim Rickards explained here on Friday, the measures are counterproductive at a time when Chinese leaders still want to attract foreign direct investment and prop up state-owned enterprises. Jim is still looking for a yuan devaluation early next year — with the same shock effects on the U.S. stock market as the last two devaluations, in August and December of 2015. 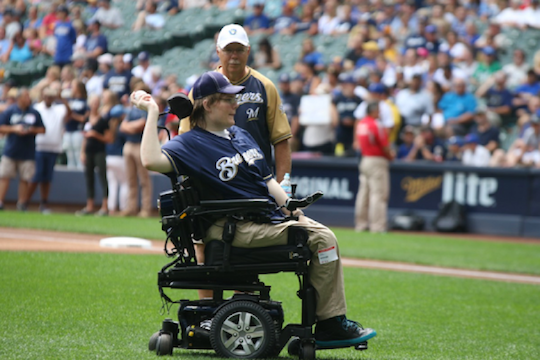 A young man in a wheelchair rolled onto Milwaukee’s Miller Park baseball diamond. He did his damndest to throw the first pitch at a Reds-Brewers game. An inspiring moment… and though fans may not have realized, it was also a historic moment. In May of last year at age 22, Lucas Lindner — the young man in the wheelchair — was in a devastating car accident. He was thrown from a pickup truck and broke his neck; Lindner awoke in a hospital to discover he was paralyzed from the neck down. Fortunately for Lindner, he was transported to a teaching hospital in Wisconsin where neurologist Dr. Shekar N. Kurpad transplanted stem cells to try to repair Lindner’s severed spinal cord. Ray’s talking about a biotech company (and its spinoff) he’s been following for years now. In Lindner’s case, he’s still wheelchair-bound but has regained control of his upper body — including fine-motor skills. Transplanting stem cells is a godsend for people with spinal cord injuries. Ray notes the biotech company is also studying how stem cell technology might be used to counteract the effects of aging. “Young, fresh, vigorous cells could be used to heal many other degenerative conditions brought on by damaged or malfunctioning cells,” observes Ray. “In fact, many of the problems we associate with aging are caused by old, senescent, malfunctioning cells,” he says. “One of the company’s long-term goals is increasing the amount of time humans can live in good health. “Wow, this statement is proof of just how dangerous and disturbing the Federal Reserve’s ideology is,” begins today’s mailbag. As we wrapped up on Friday, we noted that New York Fed chief Bill Dudley said rebuilding from a storm was good for the economy. “Really?” says our reader. “What about all the resources that are redirected away from other, useful projects? “How does a Ph.D. in economics — serving as president and CEO of the Federal Reserve Bank of New York and vice chair of the FOMC — not get that? Regardless of how flawed his models are, he can’t be this oblivious to concepts like opportunity cost and unintended consequences! The 5: One would think. Of course, Dudley’s the same one who gave us the “edible iPad” moment in 2011 — recounted again most recently here in June. “Of all the things that were discussed in Friday’s 5, the one that really pi$$ed me off was the Equifax breach,” writes one of our regulars. “Offering free credit monitoring for a year, as a result of revealing almost all of my critical personal information to the world forever, is like someone severing my arm and then offering to sew it back on for free. “Does anyone at The 5 have any insight as to why these breaches are not resulting in huge class actions? I’m usually anti-litigious, but in this case I believe it’s warranted. “I think a reasonable and prudent jury would understand the damage and risk that the claimants were exposed to and award damages accordingly. “With almost half our citizens’ critical information exposed, it has not been reported how this information could have been stolen if it was properly encrypted. “Thus, a company supposedly involved in helping protect our credit and identities didn’t even bother to take ordinary standards of care with such information by at least encrypting it or, better yet, disaggregating it between servers. “An even higher standard of care should be applied to Equifax. The 5: Cybersecurity costs money if you actually give a care about protecting your customers. Of course, you and I aren’t the real customers of Equifax and the other credit-reporting agencies. The customers are the lenders and others who eagerly buy all the data Equifax et al. gather on us. But let’s remember who else bears the blame for this debacle. Across a span of decades, Congress has either looked the other way or outright encouraged all manner of businesses to use our Social Security numbers for dozens of purposes other than ensuring Social Security taxes got paid and Social Security benefits got delivered. P.S. As we write we’re 24 hours away from the unveiling of the new iPhone — the one includes the seeds of its own eventual destruction. That’s right: Look under the hood of the new model and you’ll find the software that will ultimately prove the undoing of the smartphone… even as it launches an entirely new technology boom at least as big as the smartphone. If you missed out then, you can make up for lost time. Start here.